When I moved away from San Francisco, my biggest worry wasn’t having to learn an entirely new language. Nor was I concerned about the challenges certain to be encountered adapting to a foreign culture. No. My greatest concern was—What was I going to do without burritos? If you’re not from San Francisco, you probably have little idea how important to life a burrito is. Yes, you can now find burritos in Mexican restaurant chains in the US. Although curiously, I’ve only rarely seen them actually in Mexico. 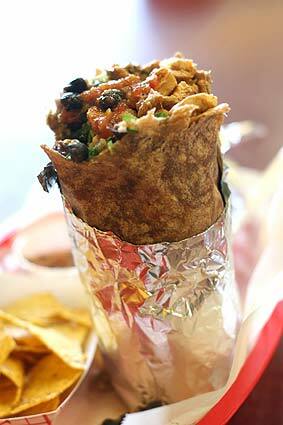 We San Franciscans, though, wear our burritos like a log-shaped, foil-wrapped bulging badge of pride. The burrito, aka the tummy-torpedo, is the perfect meal; meat, rice, salsa and beans all wrapped up in a big floppy flour tortilla. Of course, folks like to have everything from cheese, sour cream and even lettuce (ick!) added. But get a clue, folks, can someone please explain to me the appeal hot, soggy, wilted lettuce? Keep the meat and carbs, but ditch the green stuff. So back to the burrito. Basically, it’s a meal-in-a-tube, inexpensive and reasonably healthy, especially if you opt for it like I do, unencumbered by all the extras people toss in there. I just like nice warm chunks of pollo asado, grilled chicken, a spoonful of black beans, some rice, and smoked chili sauce. I skip the salsa in most places, since unripe tomatoes have the same appeal to me as a pile of soggy lettuce. Instead, where I go, they add a flurry of lively chopped cilantro and minced raw onions. And being California, they have a choice of tortillas, from spinach to whole wheat, of which I am guilty of ordering. But hey, no one said I had to be a total purist. I’m sure the Aztecs didn’t have refined flour and ate their burritos with whole wheat flour as well. Each and every San Franciscan has their own favorite burrito place. Some swear by La Taqueria, the darling of the critics. Others like the steak burrito at La Cumbre. My favorite place is….arrrgh I forgot the name! Still jet-lagged I guess. But for an inexact address, it’s the place on Church Street, right across from the Afeway. 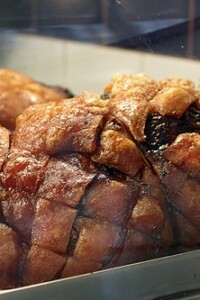 My concern when I moved to Paris was what would I eat for lunch every day? What would replace my precious burrito? At first I found solace in the falafel sandwiches on the rue de Rosiers. A fabulous round of pita, split open, and stuffed with deep-fried falafels, spicy, red-hot harissa, cucumbers, grilled eggplant and creamy yogurt tahini sauce. 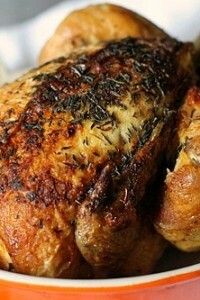 But then I found something just as good, if not better: Le poulet rôti, spit-roasted chicken. 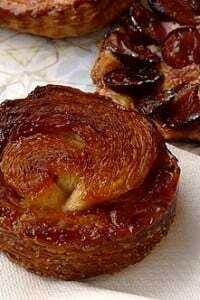 At every outdoor market in Paris there’s at least one volaillier who has a constantly turning rôtisserie with long metal bars slowing spinning chickens until they’re bronzed…no, make that very well-bronzed, and unbelievably moist and succulent. If you can find ’em, the poulet Portuguese are my absolute favorite, often called poulet crapaudine, a chicken that’s been split open, rubbed with lots of spices, raw garlic and more salt than one might think prudent. Then each bird is grilled until the skin is practically rock-hard and crackly-caramelized, which you pull off and enjoy in lick-smacking, crispy, salty bits. 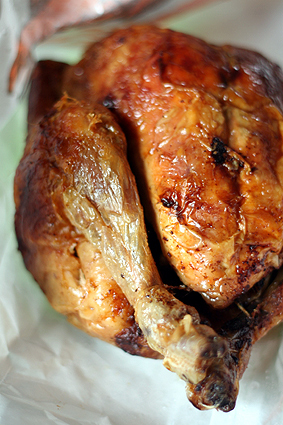 My favorite roast chicken in Paris is available only on Sunday at the Richard Lenoir market. (And please don’t tell me you want an address for that too…) At the upper end of the market is a woman, which is as close to an address as you’re gonna get, is my pal, the woman who I call la Reine de Poulet, or the chicken queen, which is actually a title her daughter bestowed upon her which she carved on her old wooden cash box. Wearing oversized glasses, short bobbed hair, and cackling like a mother hen, she shrieks out to all passers-by when the chickens are available; hot and ready-to-go. There’s always one waiting for me, just slid off the hot metal spit and wrapped in a crisp waxed paper bag. There’s all sorts of roast chickens available available, but I prefer the crapaudine. If you’re one of those people that likes juicy, moist chicken, this ain’t the chicken for you. But for some of us, this is chicken candy. And I missed mine this week. So if you happen to be in Paris, please stop by and say hi to her. I miss her and her chickens, even though I’m basking in burrito paradise here in San Francisco. But I doubt there’s a burrito queen here in San Francisco. So for this week, I’m declaring myself the king. Are you thinking about El Castillito on Church? And I’m loving your new book. In fact, tonight on Cesar Chavez and Guerrero there will be banana sorbet and a very happy family! You know it was dangerous to open this topic for discussion…..You may be thinking of El Castillito across from Afeway…but there are also Casa Mexicana and Azteca Taqueria. Personally, I love chicken mole in my burrito and that is hard to locate. Two Castro locations have it but they are only good for after bar snacking. My first ever burrito was in The Castro and I still remember it well. We’re coming to SF in September and I can’t wait to introduce my wife to the SF burrito. Like you said, the ones from the chains are just not the same. The most appropriate green vegetable for burritos is raw cabbage… it holds up to the warmth. The most appropriate green vegetable for those throw-in-everything burritos is raw cabbage. It holds up to the warmth of the rest of the fillings. You’ve nailed it. By far, the worst thing about leaving this country, is the void of “tex-mex” food/burritos in distant lands … even in Mexico !! On my honeymoon in Vancouver last summer, my husband and I found, on our second-to-last day before we returned home, a “mexican” restaurant downtown. We were in heaven, believing we were moments away from spice, flavor assault/explosion … and it was the positively, single most disappointing experience of my life, margarita included. All was horridly watered down and bland … nay, mooshy. The only cure was the report immediately, upon our return, to our “El Mundo” in Louisville, KY to right that unforgettable wrong. hi! i’m a mexican girl, and yeah we do have burritos, but they are way different from what they sell on the us =) greetings! Darn it! I thought that might have been you at Tartine, but i thought it’s not David. He lives in Paris. And to think i missed out having coffee and ice cream tasting too! Now i’m going to have to sign up for a cooking class for my David fix. David, I really hate you today. They haven’t even heard of a burrito in Italy, I am salivating and it’s 10AM!!!! Forgiven. I miss burritos. I can find tortillas easier now in Italy but it’s not the same. I feel your….pain? Need? Burrito cravings??? Los Angeles is certainly no stranger to the fabulous burrito….two different places keep me coming back, one in Santa Monica the other Silverlake.. but you aren’t going there this time are you? I’m missing Mexican food here in Japan, and am drooling over that burrito. Please don’t forget the light of my life, El Farolito. While it tends towards ruffians and drunk hipsters most, nay, all the time, it also has some of the most varied patronage I’ve seen at a burrito joint. And most importantly, it has the best burritos ever! Hi David..I moved to Vermont almost 5 years ago, but previous to that I lived in SF for 10 years ….Coincidently, my very first burrito experience in SF was at El Quake-O which happened to be located accross from the afeway on Church street. My apt. was about 10 minutes away and by the time I got home, the heat had perfectly melted the cheese. Soo good.. I can’t exactly remember when it changed hands to the current owners(late 90’s?). I was shocked when I moved from the Bay Area to Tucson, AZ…no fabulous burrito places here! There is great Mexican food to be found in Tucson, but so far I haven’t found a burrito spot where I can choose from a dozen different proteins, and all the fixin’s imaginable and create my own burrito like I could at Burrito Real or La Bamba in California. I’ve had to “settle” for burritos at Chipotle, which aren’t that bad for a chain…but your post sure made me miss my old haunts. That’s funny, Nina. I was thinking of posting about how being from Tucson, I’ve never understood the burrito craze here in the Bay Area. Give me tamales and Sonoran enchiladas any day. But, for amazing burritos (Tucson style), go to Tania’s on 614 N Grand Ave. Lotsa choices and the best tortillas! There are no good tortillas in the Bay Area. I bring them back to Berkeley every time I visit Tucson. Any of you displaced San Franciscans ever try to make a Mission-style burrito at home? Any hints? I’ve been toying with the idea for some time, but not sure where to start. Burritos in Maine aren’t very good. Laura, have you tried Bimbo’s Bitchin Burrito’s on Pine in Capitol Hill? They were pretty good when I lived there, and right at the end of my street which means I almost lived on them for a period of time. oooohh that chicken sounds heavenly! i know what you mean re everyones got a fav in sf – my roomates and i used to go to el faralito in the mission after being out and get these monster burritos, YUM! No Burrito Queen–but we’ve got the Tamale Lady, does she count as minor Mexican food royalty? Glad to see you doing San Francisco proud in the ethnic food division. And I, who have not missed burritos since I’ve been gone from SF, am not craving one something fierce. Drat. The best place to get a mission style burrito in NYC, The Brite Food Shop, just closed after 22 years due to increasing rents in Chelsea. To say I’m heart broken is an understatement, but living in SF softens the blow. i’m with you on the burrito obsession. i live in toronto (well, just outside of toronto) and will drive an hour a few times a week just to grab myself a burrito downtown. if you ever visit toronto, try a place called bar burrito on college street. haha. mmm, i could go for one right now..